On Friday, the New York Times broke the story that the Metropolitan Detention Center (MDC) in Brooklyn had been without power for days. This meant during the polar vortex that blasted NYC with single digit temperatures, incarcerated people lacked heat. They resorted to using their towels as hats to keep warm. When the power went out, the prison responded by keeping people locked in their dark cells with no free time in common areas. Clients of Federal Defenders lined up to use the phones to call their lawyers. The chief defender reached out to the warden, and when he denied a problem existed, the media got involved. The story spread across social media. Soon elected officials, families of the jailed folks, and allies gathered outside the jail. A video of the people on the inside banging out SOS on their windows went viral. 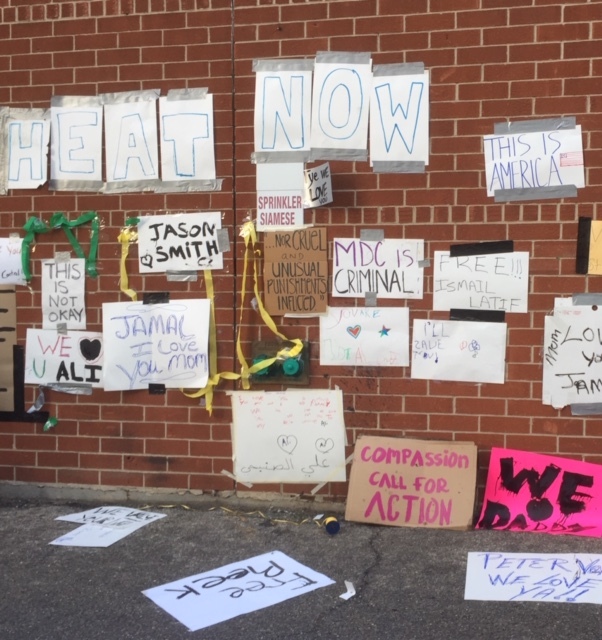 For days family and community members kept vigil outside the jail, using a microphone to call out messages to loved ones inside. As visits and phone calls had ceased during the power outage, the signals of flashlights blinking from darkened windows were the only communication incarcerated people had with their loved ones outside. On Sunday, community organizations organized a Justice Bowl as an alternative to the Super Bowl, for people to show solidarity outside the jail. Elected officials toured the jails and met with the warden, who assured them that everything was fine, contrary to what clients were telling their attorneys. People dropped off water, food, blankets and sign making materials for the activists and family members keeping vigil. Finally, Sunday evening electricity was restored as the crowd outside cheered with more enthusiasm than any Patriots or Rams fan. As I write this, families are allowed to visit again, but there are reports of retaliation. Yesterday the Federal Defenders filed a lawsuit against the Bureau of Prisons and Warden Herman Quay. Today (February 5th) a public hearing on conditions at MDC will be held. Earlier last week, defenders sat vigil in court in Manhattan and successfully persuaded the Manhattan District Attorney's Office to withdraw their motion to quash a defense subpoena. For background, New York has one of the most restrictive discovery laws in the country prompting even the New York Times in a recent editorial to ponder how to make New York as progressive on criminal justice issues as Texas. Defense is not entitled to police reports, witness statements or grand jury minutes until literally the eve of trial. In this context, defenders routinely vigorously investigate cases independently, including subpoenaing videos from the ubiquitous video surveillance cameras in NYC. Last week a public defender subpoenaed video after her client was arrested and arraigned, but before he was indicted, as is common practice. The Manhattan District Attorney's Office had the gall to file a motion to quash arguing that defense has no right to any kind of investigation pre-indictment. Additionally, prosecutors told the subpoenaed party that they did not need to comply with the subpoena. The defender bat signal was raised above Gotham, and 50 public defenders from three different agencies packed the courtroom at the time of the proposed hearing. With no opposing counsel in sight, lawyers began frantically tweeting, tagging reporters and elected officials. After half an hour, two assistant district attorneys slunk into the courtroom, dodging the daggers shooting from the eyes of the defenders in the audience. The judge, who viewed the scene with a bemused (and at times terrified) expression, used her constitutionally granted power and autonomy to rule that the venue for the motion was inappropriate. Defenders marched to three different courtrooms as judges played hot potato. Finally the District Attorney's office caved and withdrew the motion to quash. In both instances, defenders advocated for their individual clients by pulling together to fight an unjust system. Had the prosecutor's motion to quash succeeded, the ability of all defenders in Manhattan to thoroughly investigate cases would have been even further weakened. The display of unity by the defender community showed the prosecutor that we don't view each case in isolation; we work together to keep abuses of power in check on behalf of all our clients and each others' clients. At MDC, again defenders are challenging the conditions not just for their individual clients, but for all those who are incarcerated. In that instance, a display of lawyerly unity was insufficient and we needed the voices and energy of the community to stand up against the Federal Bureau of Prisons. Just as no defender can do this job alone, no defense agency can fight the systemic injustices alone. When we do all work together, the result is, well, electrifying.